Being greeted by Atlantic Harbor Seals on your way up to the New England Aquarium overlooking Boston Harbor is a great way to get Day 1 going. The aquarium, featuring a wide range of aquatic species in dynamic exhibit tanks and areas, opens at 9am, the best time to spend an hour without all the crowds. The first Freedom Trail History Tour of the day departs from ArtsBoston/Bostix Booth at Faneuil Hall at 10:30, and on every half past the hour after. Their 11am tour departs from the Boston Common Visitor Center, and every hour on the hour after. The 90-minute walking tour along the “red line” in Boston’s historic downtown is led by engaging guides in 18th century dress. Along the way Boston’s colonial history comes to life in the stories they tell which pull together the critical role Boston played in the lead-up to the American Revolution. The tour passes by 11 of the 16 historic sites along the trail, including important sites tucked in among Boston’s contemporary downtown skyscrapers. At each historic site – Old State House & Boston Massacre Marker, Old South Meeting House, King’s Chapel & King’s Chapel Burying Ground, Park Street Church, Boston Common, State House – its historic role is explained. 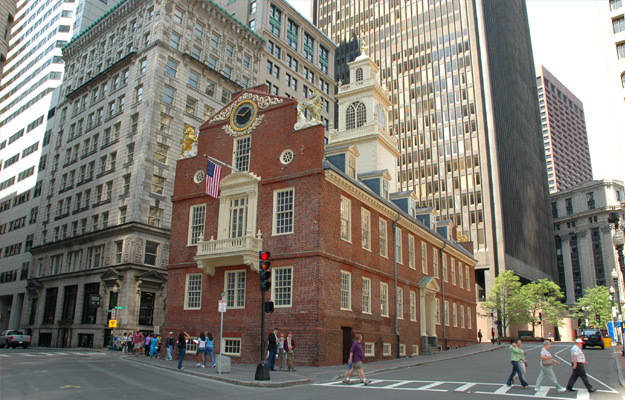 Note: Freedom Trail tours pause outside of the historic sites, they do not enter them. Should you want to have a look inside, carve out the time to go back later. While the Freedom Trail extends into the North End, Boston’s oldest neighborhood, it’s not included the Freedom Trail’s Walk into History Tour. It can be added on or purchased separately. We suggest exploring it on your own. It’s easy and it’s a great place to have lunch. Hilly streets wind around in North End, which makes for a for an interesting walk. Old brick buildings, from North End’s colonial and Italian past, appear to lean in on narrow brick and cobblestone streets. Take the time to pop in to some of the eclectic small shops along the way. Make your way to tiny, old (1680) Paul Revere House . Allow 30 minutes for a guided tour. Walk along Hanover, the active community’s main street lined with small storefront shops and restaurants. Stop for lunch at any of the many Italian. Go inside historic Old North Church, from whose steeple on the night of April 18, 1775, signals were sent to let patriot Paul Revere know by which route the “Regulars” were advancing into Concord. Allow 15 minutes for a self-guided tour of the beautiful church, filled with intact historical architectural details. While on Old North’s campus, check out the gift shop and take 15 or 30 minutes to visit Edes & Gill Printers and Captain Jackson’s Historic Chocolate Shop. Enter Charlestown Navy Yard, home of USS Constitution and the USS Constitution Museum. To get to the Museum you will pass an amazing sight: Old Ironside is out of the water in Dry Dock 1, adjacent to her mooring berth, where she is undergoing major restoration work until 2017. Seeing the oldest commissioned warship afloat in the world out of the water is fascinating. It’s a once-in-a-lifetime photo op! Walk over to the USS Constitution Museum to learn about Constitution’s story, the War of 1812, the beginnings of the fledgling US Navy, and the on-going restoration. It’s an interactive and engaging place for a self-guided hour tour. Walking through both parks and exploring the streets bordering them is a wonderful Boston experience. Knowing that the Common has been a public park and important gathering spot of the people since 1634 and that a lot of history happened here – public pilloring in the early Puritan era, British encampment during their occupation of Boston, and protests of all kinds that continue even today, adds to the adventure of criss-crossing the Common down well-traveled footpaths. Along the way you’ll come upon statues, monuments, markers, gazebos, and Central Burying Ground, established in 1756. 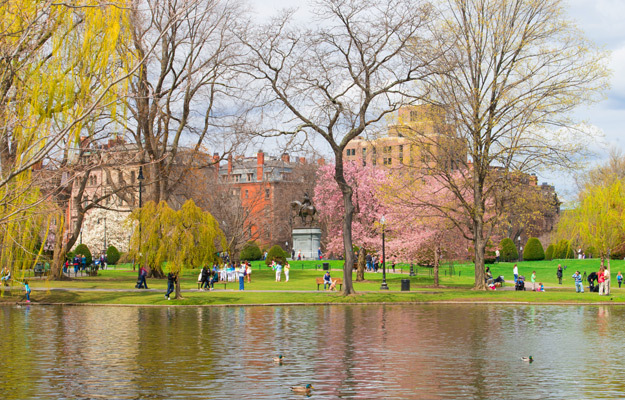 Take a photo of the gold-domed State House shimmering in the sun, stop by Frog Pond and wander through shady Public Garden. Enjoy a relaxing 15 minute ride on a Swan Boat (mid-April through Mid September). Stroll along any of the bordering streets, and stop for a bite to eat and people watch at a café or restaurant on Boylston. Browse through upscale shops housed in brownstones on Newberry St., just off Arlington, and have a drink in Cheers of TV fame on Beacon. A landmark in the Back Bay neighborhood, is a good place to start Day 2. There are plenty of great places to grab a cup of coffee and a tasty breakfast treat. Imposing Richardsonian Romanesque Trinity Church anchoring one end of Copley Square has been a vibrant Episcopal church since 1733. Take a half hour to admire the grand interior details on a self-guided tour. 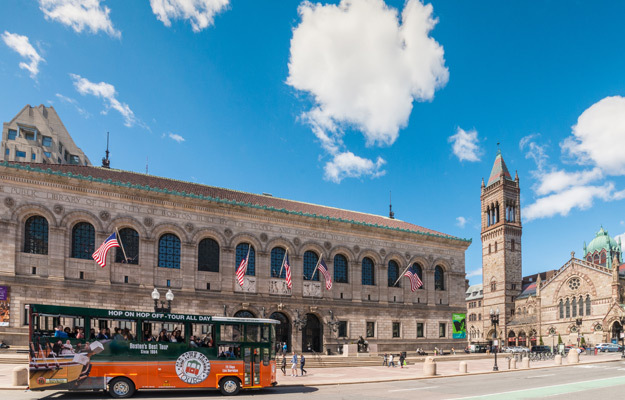 Or, opt instead for a visit to the Boston Public Library on the opposite end of Copley Square, where there is more than an amazing collection of books inside. Allow an hour for a self-guided tour of the McKim building, filled with art and astounding architectural spaces. On the outer edge of the Back Bay neighborhood, is a must-see. Filled with world-class art, there is no way to get to all the galleries in a whole day, much less a couple of hours. To decide what to see in the Museum’s comprehensive collection of over 450,000 works from art of the Ancient World to Contemporary Art, and from the Americas, Europe, Asia, Africa and Oceana, pick up a map from the info booth, ask questions and spend 2 hours enjoying exhibitions of your choice. End your MFA visit with lunch with tableside service and great food in New America Cafe, in the soaring glass-enclosed atrium entered by the Chihuly glass tree. Compact, hilly and lovely, walking is the only way to experience historic and affluent Beacon Hill. Charming gaslamp lighted streets and colorful window boxes hanging from lovely townhome windows make the quiet walk enjoyable. Look for quaint, tiny Acorn Street and leafy Louisberg Square. Learn of the contributions of African Americans in New England from the colonial period through the 19th century on a self-guided tour of the Museum of African American History and the African Meeting House. Visit elegant, 4-story 1804 Nichols House Museum for a glimpse into the lifestyle of Beacon Hill resident in the 19th and 20th centuries. Boston Tea Party Ships & Museum is a dynamic, high-energy end to Day 2. An interactive floating museum, where authentically costumed actors portraying key players in the Boston Tea Party involve you in the action, begins inside the replica meeting house. They are so authentic, you become totally committed to their rebellious cause. You storm down to Griffin’s Wharf to board one of the replica ships to dump the tea into the harbor! Then, it’s into the museum where high tech visuals explore the consequences of the emboldening act that helped spark the American Revolution. End the engaging experience in Abigail’s Tea Room, on the top level of the Museum, with a cup of tea and a scone, a piece of Boston cream pie or light fare, Boston clam chowder and wine or beer as you relax in the colonial charm surrounded by panoramic views of contemporary Boston. Boston has so many great restaurant choices located in Downtown, Back Bay, North End, South End and up and coming Seaport District. Downtown is a thriving business district with trendy bars and restaurants catering to young business people. Back Bay’s restaurants are all over the board – sophisticated, trendy, ethnic, chain, pricey and cheap. Chinatown is an enclave bustling with activities, with small storefront family restaurants of every Asian cuisine imaginable. Trendy and growing Seaport District has a lively evening bar and restaurant scene, as does the rapidly gentrifying artsy South End neighborhood.